Christian Busk is on a mission to restore old Florida. Landscape architect Christian Busk is known equally for his work relocating mature trees in landscapes as he is for restoring and relocating vintage homes in Bonita Springs. Many months and more than $500,000 later, the house emerged as a shining example of restoration. “Some people collect antiques,” he says. “I collect antique homes. It’s my hobby.” In 2003, shortly after completing work on the Williams-Packard House, Busk found another opportunity in Bonita Springs-the E.P. Nutting House, named for the citrus shipper who moved in back in 1942. This historic home was located on River Drive and bound for destruction when Busk bought it and moved it across the street from the Williams-Packard House. Originally built around 1913, the Nutting House presented yet another architectural rarity. “It’s a simple-looking gray house, but … the craftsmanship and design make the house a real piece of history,” Busk says. Since 2003, he has lovingly restored this home as well, filling it with pieces from his collection of mid-20th century art and furniture. In the summer of 2004, he purchased the Higginson House on Dean Street. “This home, built in the 1920s, represents another important part of Bonita Springs’ history,” he says. “There is a lot of beautiful wood in this home-dark, gorgeously aged wood that has never been painted. 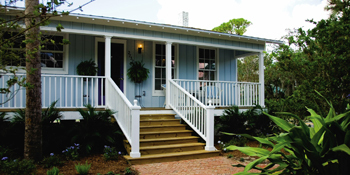 It is a home with incredible possibilities.” Earlier this year, Busk worked with the Bonita Springs Historical Society to save the Glazier Home, a prefabricated kit house built around 1910. “It’s a wonderful example of the first prefabricated homes ever made in this country,” Busk explains. 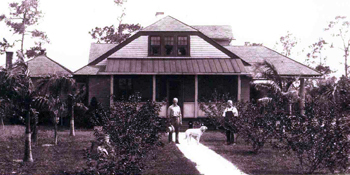 In 1942, Nutting purchased the tiny gray cottage. During his lengthy tenure, minor changes were made, but the house remained much like it was when first built. Landscape architect Christian Busk first saw the house on the front page of the Bonita Banner along with a story that caught his imagination.